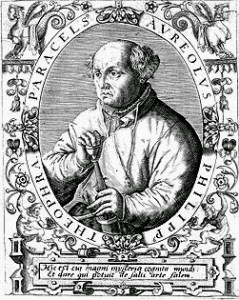 Theophrastus von Hohenheim, "Paracelsus" was the son of a German physician living in Switzerland. He took a degree in medicine from the university at Ferrara and proceeded to wander through Germany, France, Spain, Hungary, the Netherlands, Denmark, Sweden, Poland and Russia. He died in 1541, nearly half a century before the various pamphlets he wrote started to be noticed and reprinted. In his lifetime he was hounded out of one European city after another for defying traditionally accepted medical practices and insisting on doing things his own way. He was known for somewhat difficult personality, and the somewhat gloomy but steadfast conviction that the world would shortly come to an end. Today he is celebrated for basing his diagnoses on a careful observation of nature, and of his patients actual symptoms, a sometimes radical departure from the norm for his time. By the end of the sixteenth century, his writings were being circulated among the intelligentsia of the Florentine royal court in Italy. His opinions extended not only to medicine and anatomy, but also to alchemy, botany, pharmacology, astrology, and what would later be called psychology. Paracelsus' philosophy was a powerful influence on the education of Antonio Neri in the discipline of alchemy. Neri's father was the royal physician to Florentine Grand Duke Ferdinando de' Medici, and almost certainly did not subscribe to Paracelsan ideas, but Antonio seems to have taken a different path. His benefactor, Prince Don Antonio de' Medici was a confirmed Paracelsan. By the time Neri's book on glassmaking appeared in 1612, the priest counted himself a devoted Paracelsan spagyricist and he as much as says so. In his introduction, he holds out the future possibility of publishing “the experience of my endeavors over many years, working in diverse parts of the world […in] the chemical and spagyric arts.”  Paracelsus had pioneered two new disciplines that he named "iatrochemistry" and "spagyrics." Iatrochemistry dealt with the use of minerals and chemicals in medicine; spagyrics made use of plants and their extracts. Here we get a hint that Neri's true passions lie beyond the formulation of glass. Speaking about the potential of chemistry in medicines, also in the introduction, he writes, "These are matters of nature to which I believe there is no higher calling in the service of humanity." The same techniques and terminology used to produce medical remedies shows up in Neri's glass formulations. Twice, he refers to ingredients as "medicine,"  which he adds to the glass melt in "doses." He also uses the somewhat specialized apothecary's term 'ana',  which means "in equal parts." Paracelsus coined the word "spagyric" in his book Liber Paragranum,  where he argues medicine should be based on the physical laws of nature alone. The word derives from two Greek terms: spao meaning to separate and ageiro meaning to combine. The underlying philosophy recurs throughout the history of alchemy. To enhance the special properties of a plant, break it down, to its separate constituents, then purify each and recombine them for a more potent product. Herein lay the bones of Neri’s empirical methodology with glass; one built on the processes of reduction, purification and recombination. These methods appear throughout his technical recipes. Neri utilizes the method with both plant and mineral ingredients, in the preparation of basic materials and pigments and throughout his medicinal work. You could say that these very techniques and the resultant near mania he developed for purification are responsible for the high reputation of his glass formulas. His colors were bright and clear beyond what was produced by typical preparation by artisans of his time. History has mostly remembered Neri as a glassmaker, but his own philosophy was a bit different. He considered himself first and foremost an alchemist and his art—the art of chemistry—was a discipline that embraced metallurgy, glassmaking and medicine. Very nice article. For those interested in Paracelsus, I suggest reading The Devil's Doctor by P.Ball. It's a beautifully written book supported by facts instead of fairy tales that most authors use. Thanks! Another good book on the subject is "Paracelsus: Medicine, Magic and Mission at the End of Time" by Charles Webster.